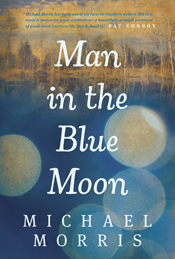 MAN IN THE BLUE MOON tells the story of Ella Wallace, a mother of three boys whose husband has disappeared and left her high and dry. She desperately wants to keep the land that's been in her family for generations, but an unethical banker has different ideas about how the land can be used. Ella becomes more and more desperate to provide for her sons and save her land, and her prayers seem to be answered when a strange man claiming to be a relative of her husband's arrives and promises to help her. Ella gradually begins to trust Lanier despite some pretty strange actions on his part; however, others begin to turn on him as many of the secrets about his past are revealed. There are some outstanding reviews for MAN IN THE BLUE MOON floating around the blogosphere, so I have a feeling that my reaction to this novel might be different from most. (Heck - Pat Conroy even blurbed it!) If I'm being entirely honest, I had a hard time getting through the novel. I just felt as if the story could have been told with less words. It's possible that I just wasn't in the mood for a book like this right now, but I found myself reading only a few chapters a day; and that's pretty unusual for me. I also had some issues with the pacing of the story -- some parts were a little tedious for me while other parts seemed to go by very quickly. However, I think what was the biggest issue to me about MAN IN THE BLUE MOON was the author's writing style. I'm not usually a big fan of novels with a lot of descriptions, and Ms. Morris definitely uses a lot of details and even metaphors. Initially I was impressed with well he brought to life this small town through the use of his eloquent prose; however, I eventually thought some of it was a little over-the-top. I recognize that I'm more critical of flowery descriptions than most readers, and I'm sure many will think his writing is absolutely beautiful... and for the most part I agree. In addition, I had some difficulties relating to the characters. I really never felt as if I was invested in Ella's life; and I think that made a major difference in how I perceived her story. I so wanted to feel Ella's pain, both with the loss of her husband as well as her plight to save her land; however, she seemed a little distant to me. And as far as the "bad guys" go, I thought they were fairly stereotypical; and I wanted some more dimension to them as well. I know it sounds like I didn't enjoy MAN IN THE BLUE MOON at all; however, that's not the case. I just didn't enjoy it as much as I had hoped. There are many very good things about this novel including Mr. Morris' ability to create a story. I very much appreciated the basic premise of MAN IN THE BLUE MOON, and I thought it was very cool how the author based a character on a real life event experience by his grandfather. I also liked how well Ms. Morris captured the essence of a small Florida town in the 1920s as well as the the mentality of the townspeople. And furthermore, I appreciated how he introduced some interesting and complex questions about faith into the story. I commend the author for dealing with these faith issues in an intriguing (and non-preachy) manner. Because of these reasons, I do think many book clubs, especially those that like Christian fiction, would enjoy discussing MAN IN THE BLUE MOON. As you can clearly see, my thoughts about this novel are quite different from the majority; and when people have different views about a book, there is always the possibility of a great discussion. A reading guide in included in the back of the book with fourteen thought-provoking questions. Some of the themes you might want to explore include family, obligation, miracles, love, commitment, forgiveness, sacrifice, faith vs. discernment, and hope. You can also discuss the actions and motivations of many of the characters. Overall, I do think MAN IN THE BLUE MOON had some merits and will appeal to many readers who enjoy Christian and historical fiction. You can read more about the on-line She Reads book club and MAN IN THE BLUE MOON here. There is even a giveaway for a custom necklace and copies of the book if you participate in the on-line discussion. I guess it shows just how UN-Christian I am. I must have totally glazed over during any Christian theme sections. Truly I saw the preacher, evangelist, and faith healer as just part of Southern life but not as any kind of commentary on Christianity. Ooops. I guess I'm a little dense. I'm only a hundred pages into this one so I'm going to reserve judgement for the time being. I am finding the pacing to be very slow and a few of the metaphors have been over the top - we'll see how the rest of the book goes. I, too, felt sometimes the story went on longer than it should have. Sometimes I wanted to shake Ella. She exasperated me. Great review!